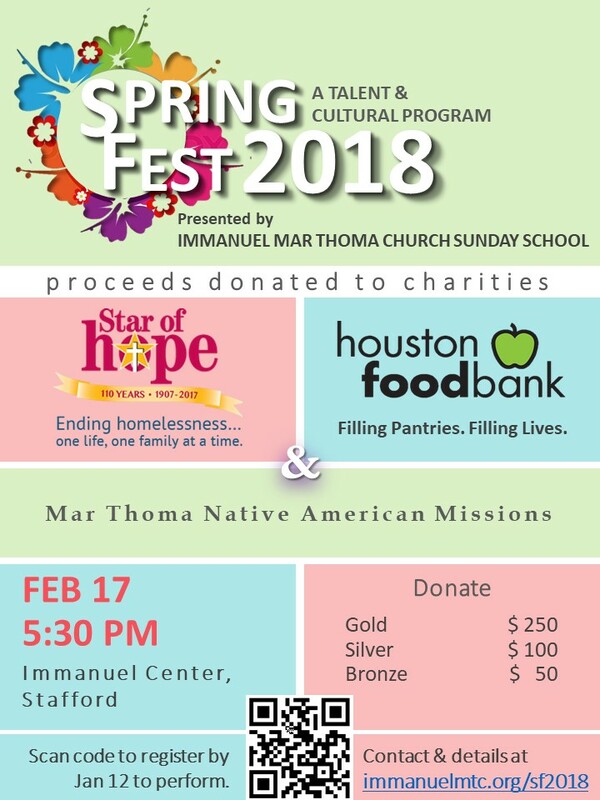 The Sunday School hosted Spring Fest 2018, a Cultural and Arts Fundraiser program on February 17, 2018 at 5:30 PM. Spring Fest 2018 is a cultural/talent night organized by our Sunday school family to teach and encourage our Sunday school students to use their talents and time to help those who are less fortunate. This year we will support the Marthoma Native American Missions and other local Houston charities including Houston Food Bank. The cultural fest has traditionally been a student and parent led event which gives our students the flexibility to prepare items using their own unique gifts. In the very young grades, Sunday School teachers coordinate items.